Corinne and Arthur Cantrill, two of Australia’s leading experimental filmmakers, will take over La Mama Theatre (Faraday St, Carlton, Melbourne) from Wednesday to Sunday, August 8 to August 12, in a celebration of their career in filmmaking to date. They’ll show some of their work in innovative documentary, multi-screen projection, film-performance, single-frame structuring, ‘landform/filmform’, and three-colour separation. Arthur and Corinne Cantrill are the primal couple of Australia’s fringe film community. 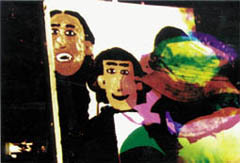 Their enormous body of work – more than two hundred films and counting – have taken on issues of autobiography, the Australian landscape, ethnography, their autistic son Ivor, their sponsorship of a Becak driver in Indonesia – as well as the qualities of a medium that they have embraced with all the tenderness of a lover. About to enter the fifth decade of their making, the Cantrills have shown little signs of slowing.energizing Melbourne with screenings and performances, lobbying for the preservation of film art and recovering lost makers and history. As well as marking 40-plus years of our filmmaking collaboration, Light Stream also celebrates the film-performance work we’ve designed for exhibition at La Mama since 1976. This intimate, squarish space, with the bubbling coffee percolator, the fireplace, and the restaurant next door emptying their accumulated bottles nightly, is so different from the formal, rectangular cinema – it puts us right in the projected image, and in the laps of the audience, as we talk about the films and the circumstances of their production. (In any case, there’s nowhere else in Melbourne to show our work, these days!) We’ll cover the walls with a display of posters and stills. The opening program, “Finding The Way – Early Films, 1960-1970”, on Wednesday, August 8th at 8 pm, will include two of the eleven films on child art we made in Brisbane in 1960 for the ABC children’s television show (our first 40-odd films were all sold to the ABC! ), presented in a 2-screen projection, and some early films on art – Robert Klippel’s sculpture studies, also shown 2-screen, and extracts from our films on Klippel’s drawings, and Charles Lloyd’s printmaking, the latter made during our four years in London in the late ’60s. The program will also include Dream (1966), a short animation of Lloyd’s dry points, and Red Stone Dancer (1968), an exercise in chance associations, made as a footnote to our BBC documentary, Henri Gaudier-Brzeska (1968). Also screening will be films from our legendary 1971 Age Gallery Expanded Cinema show, including the Vorticist Blast (1971) film-performance, with its prepared screen based on Vorticist graphics, and the Boiling Jug (1970) film, which is projected on the steam from a real boiling jug. “The ANU Films”, made during our 1969-70 Australian National University (ANU) Creative Arts Fellowship, are on Thursday, August 9th at 8 pm. They include the feature-length Harry Hooton (1970) – the ‘anarcho-technocracy’ of the Sydney poet (‘there’s a new world awaiting its builder, the poet’) realised on film. 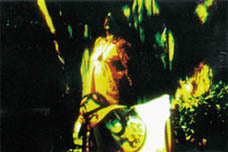 At the time, Age critic, Colin Bennett, described it as “a mammoth job of McLuhan-age semi-subliminal editing and superimposition […] eye-engaging impressionistic work with electronics and opticals, colour and light.” While Mary Armitage, of the Adelaide Advertiser, claimed it was “…a brilliantly free, yet tightly-edited application of sound, light and visual image to a complex theme.” (These were the days when the mainstream press was interested in non-mainstream cinema!) Accompanying this film will be 4000 Frames (1970), White Orange Green (1969), Bouddi (1970) – made concurrently with Harry Hooton – and Video Selfportrait (1971). On Friday, August 10th, and repeated on Saturday, August 11th, both at 8 pm, will be a program of “Recent Films And New Films”, including Light Shards, Floriana on the Esplanade and Capricornia (all 2001), the latter two shot in Far North Queensland. Capricornia, filmed in Cairns and the Atherton Tablelands, is a tribute to Xavier Herbert who lived in Cairns and whose 1938 book Capricornia is a powerful narrative of European settlement of this area in the past two centuries. Our film witnesses the continuing pressures of development and tourism on this rainforest country. We have blown up these three Super 8 films to 16mm on the optical printer ourselves, reworking the Capricornia footage with bi-packed images. 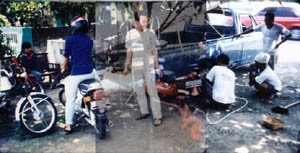 Becak Driver – Superimposed (1999) shows passages from the Super-8 film/performance The Becak Driver – a Story from Yogyakarta we gave at La Mama in 1998, copied to 16mm and partly superimposed in double projection; the images recalled in changed relationships – just as overlapping remembrances of past events can construct an altered reality. More formally, it is an exercise in the way the eye/brain deals with an image that is ambiguously superimposed with another. The soundtrack combines Javanese music with intermittent grabs of wild location sound, spatially separated. Shooting on Super 8, and enlarging some films to 16mm for ease of exhibition and sales, with the stereo soundtracks on cassettes or CDs, is an affordable way for us to continue working, since we don’t apply for funding. The program of new work will premiere a landscape film shot in the Grampians on 16mm Kodachrome (we’ll project the camera original) and we’ll also show the 3-colour separation film, Garden of Chromatic Disturbance (1998) shot on B&W high-contrast negative and printed on Eastmancolor print stock. Both films we shot many years ago, and recently completed. We consider Garden of Chromatic Disturbance to be one of our most significant films. “About Ivor”, on Sunday, August 12th at 6 pm, is a program of films which feature our 41 year-old autistic son Ivor Cantrill and his art. He has collaborated with much of our filmmaking, beginning in London, and then with Home Movie – a Day in the Bush (1969), shot in Canberra. More recent films are the 3-colour separation Ivor Paints Arf Arf (1998), the Super 8 films – Agung Gives Ivor a Haircut (1991), shot in Yogyakarta; Ivor’s Tiger Xmas Card (1997), an animation of variations on a Xmas card he designed one year on the computer; and Ivor Paints (1995), which is a 78-minute account of his creation of a still-life oil painting from beginning to end. Corinne and Arthur Cantrill, two of Australia's leading experimental filmmakers, will take over La Mama Theatre (Faraday St, Carlton, Melbourne) from Wednesday to Sunday, August 8 to August 12, in a celebration of their career in filmmaking to date. They'll show some of their work in innovative documentary, multi-screen projection, film-performance, single-frame structuring, 'landform/filmform', and three-colour separation.